I’ve been having a bit of a blog-holiday so apologies for being so quiet. But I’m back now and starting the new year (happy 2017 everyone) with tales of my recent trip to Vietnam and Thailand. My first time in Vietnam and I totally fell in love with the country – its people, food and unfolding story. Ho Chi Minh City (HCMC) is the largest city in Vietnam, although not the capital (that’s Hanoi in the north). In 1976 it was officially renamed Ho Chi Min City after the Communist revolutionary leader Ho Chi Minh. It’s still widely called Saigon, though, (especially by the Vietnamese) which it was under French rule when it was the capital of Cochinchina. The sprawling city has a population of more than 10 million and it’s rapidly growing, too. This makes for a serious hive of activity, hectic traffic, an energetic and hardworking people and, on the downside, somewhat polluted skies which means most citizens wear masks on the streets. There’s something happening around every corner and a friendliness and energetic feel that’s catching. 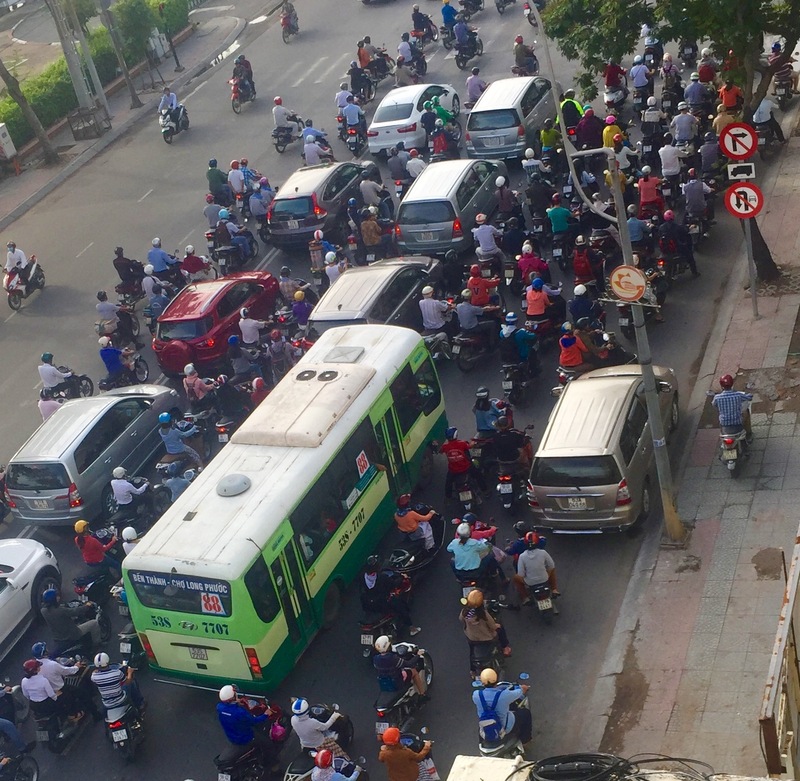 Here’s what you have to do when in HCMC. In the centre of the city this bustling, partly undercover market sells pretty much anything you could possibly desire. 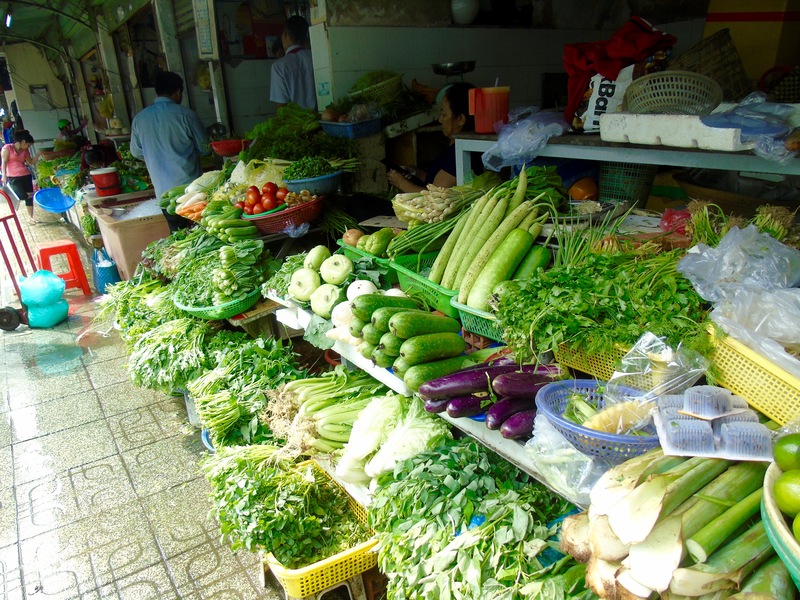 Exotic, fresh vegetables and fruit, live fish and shellfish in all shapes and sizes, clothes, jewellery, souvenirs. The highlight is the towers of great quality, cheap t-shirts to choose from – don’t leave without one – Vietnamese cotton is fabulous. 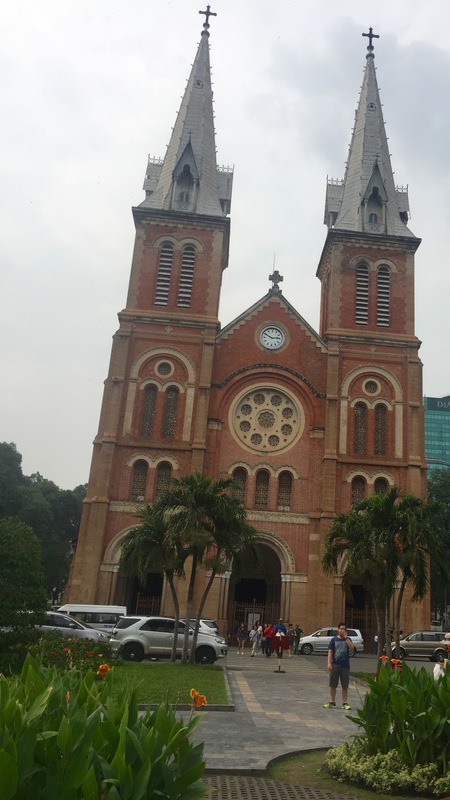 Saigon is a great city to walk around. The centre is quite small and the best way to see everything is on foot. Notre Dame is the city’s most famous landmark. Built from the 1860s to the 1880s, it’s a reminder of the French influence – all the building materials were brought over from France. Newly married couples and their entourages cluster around the cathedral for wedding pictures – it’s said to bring good luck. It seems that everyone wants their picture taken in front of Notre Dame. 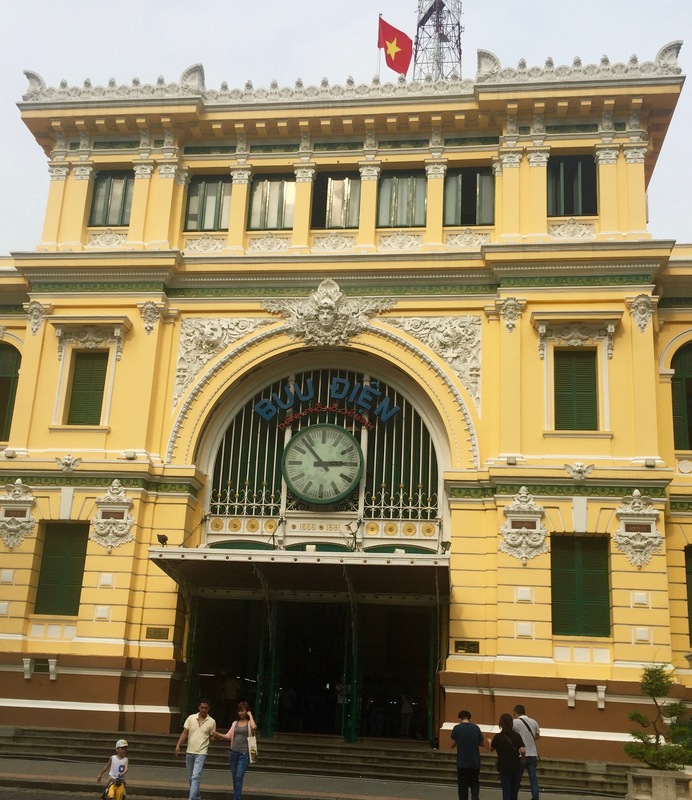 Saigon is also home to the most beautiful post office I’ve ever seen – designed by French architect Gustav Eiffel, who the Eiffel Tower was named for. 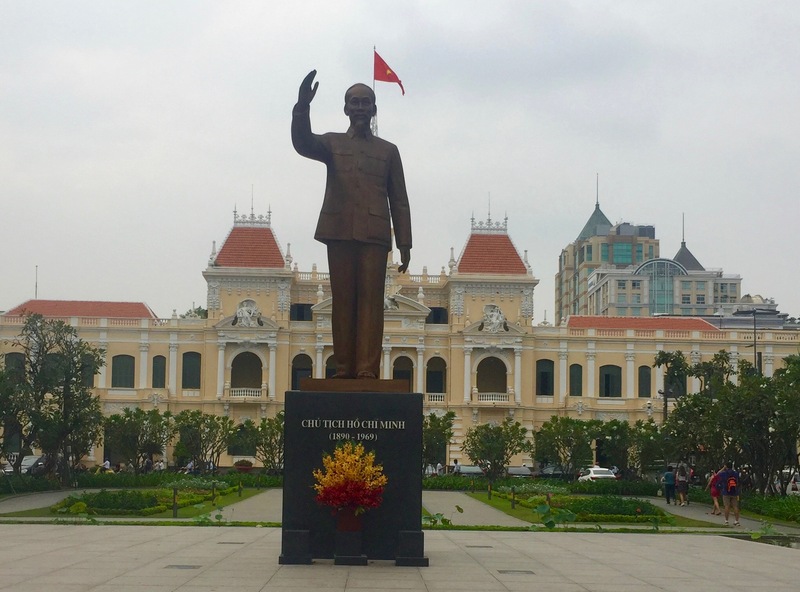 Ho Chi Minh himself takes pride of place in the square in front of the City Hall which was built in the early 20th century – some more of that Parisian flavour – the city is also known as The Paris of the East. 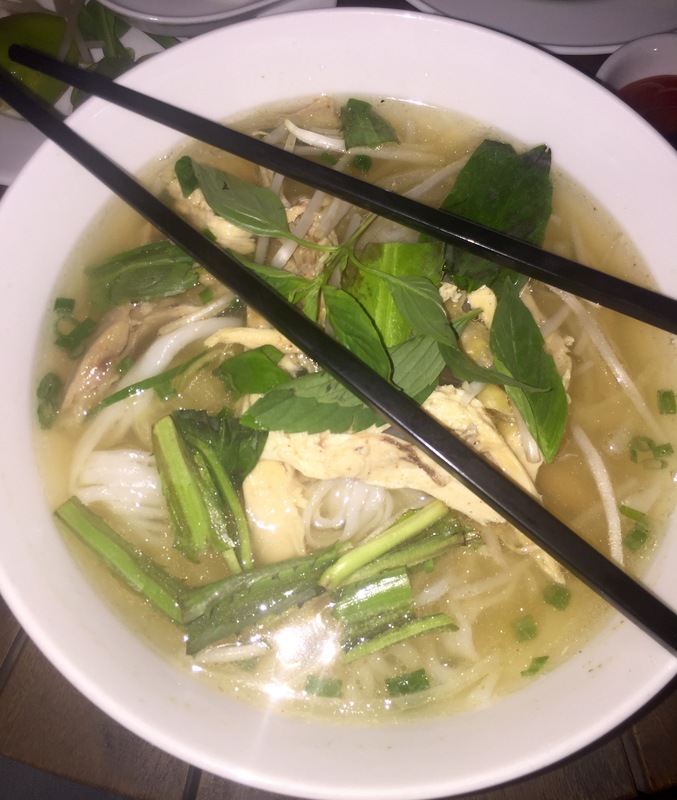 When in Vietnam…eat Pho. It’s a traditional Vietnamese soup consisting of broth, noodles, herbs and meat. 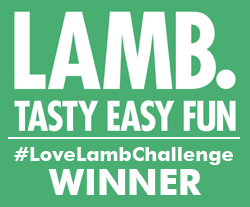 It’s popular street food and it’s eaten any time of day – even for breakfast. Usually served with a plate of herbs on the side so you can add them to suit your taste. A deliciously, satisfying one-pot meal, one that I am certain to be making at home. Oh and there’s plenty of other street food on offer too. Coffee is the most popular drink in Vietnam and coffee shops abound in the city, so no problem getting your caffeine fix as you explore. Okay this isn’t the happiest thing you’re going to do in Saigon but I’m big on remembering and learning from history – something humans really aren’t that good at. This museum offers a pictorial record of the brutal Vietnam/American war and its aftermath. Some of the photographs are stunningly heart breaking and while the story is clearly told from a Vietnamese perspective the exhibits provide an almost overwhelming overview of this horrific time in Vietnamese history. 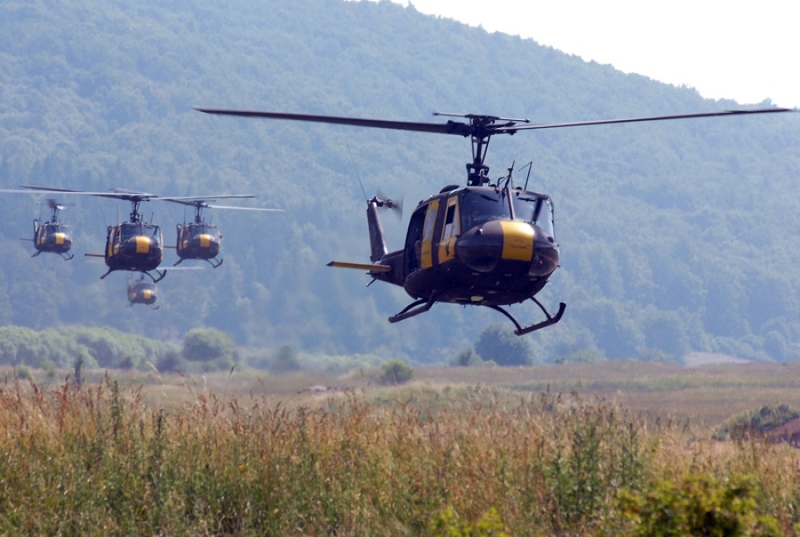 Outside you can see the planes and the iconic Huey helicopter that I always associate with Vietnam. I’m too young to remember the war but one of my favourite songs is Goodnight Saigon by Billy Joel which is possibly one of the most powerful songs ever written. Worth a listen. Get a different perspective on the city and enjoy a local beer (or a tasty cocktail) at the same time. Our hotel The Majestic (more of which later) has a lovely roof-top bar overlooking the Saigon River. The perfect place to relax and plan over a cold one. The traffic is kind of a tourist attraction in its own right. 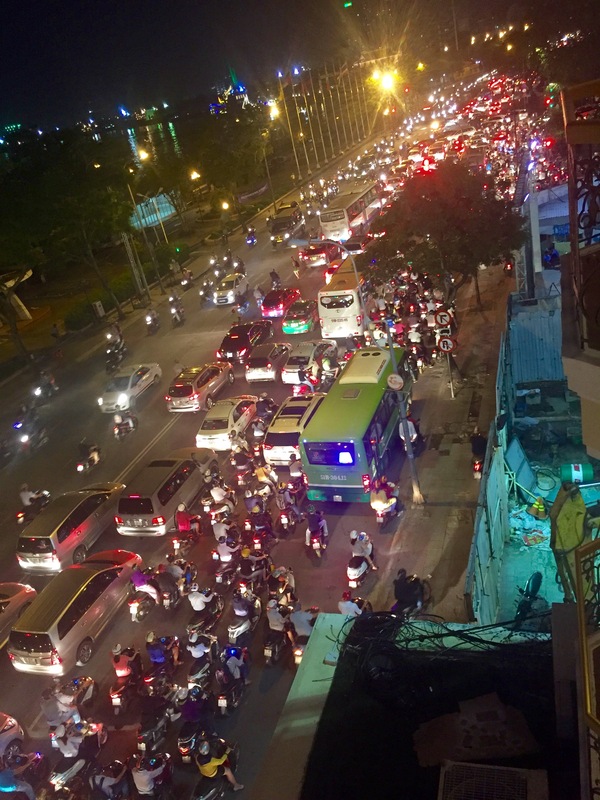 There are millions of motorbikes in Saigon (they say there’s 25 to each car – and there’s no shortage of cars) and they don’t stop at red lights and have no compunction about riding on the pavement. So you need to keep your wits about you wherever you’re walking. I diligently pressed pedestrian crossing buttons to begin with but a red light didn’t stop the traffic. The best way to get across the many-laned roads is to walk at a steady pace without hesitation (when the lights are in your favour obviously) and the traffic will avoid you. Yes, I know I didn’t believe it either, but it seems to work. 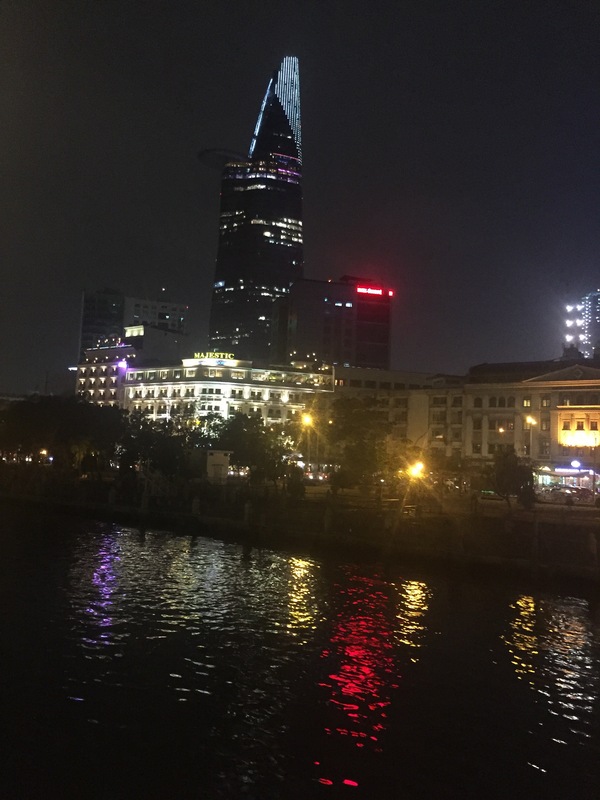 I do love seeing a city from the river and the Saigon River is perfect for a cruise. We hopped on board our junk Le Perle de l’Orient at 7pm and settled in at a window table to take in the view. 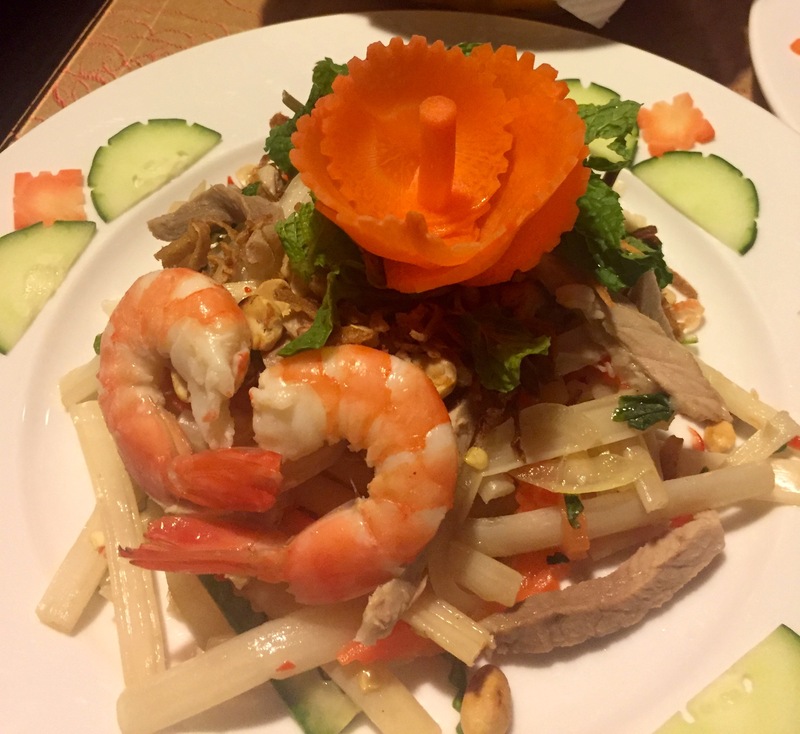 And enjoy a nine-course set menu of delicious Vietnamese food. The modern part of the city’s skyline sparkles in different colours, making for beautiful reflections in the river. 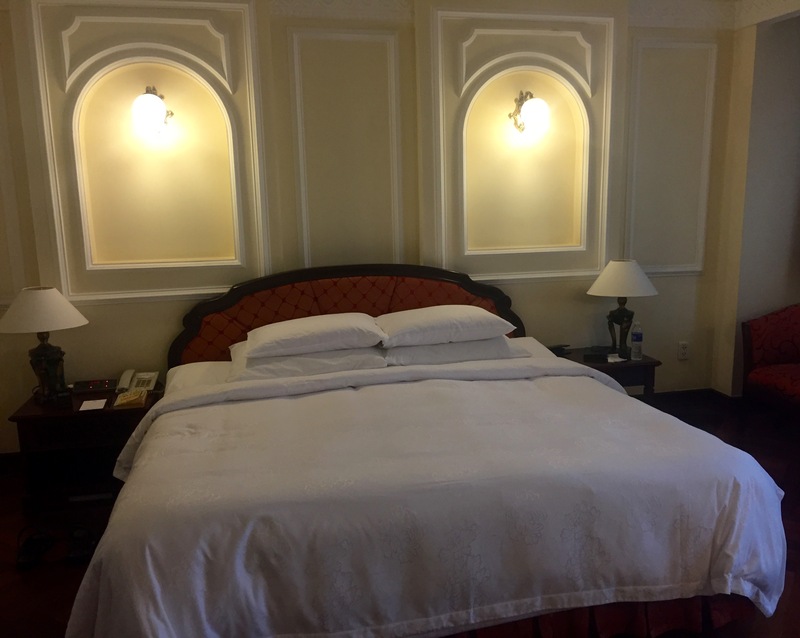 We stayed at The Majestic Hotel, perfectly placed on the riverside corner of Dong Khoi Street – one of the best shopping streets in the city. The best linen in the world? Possibly. 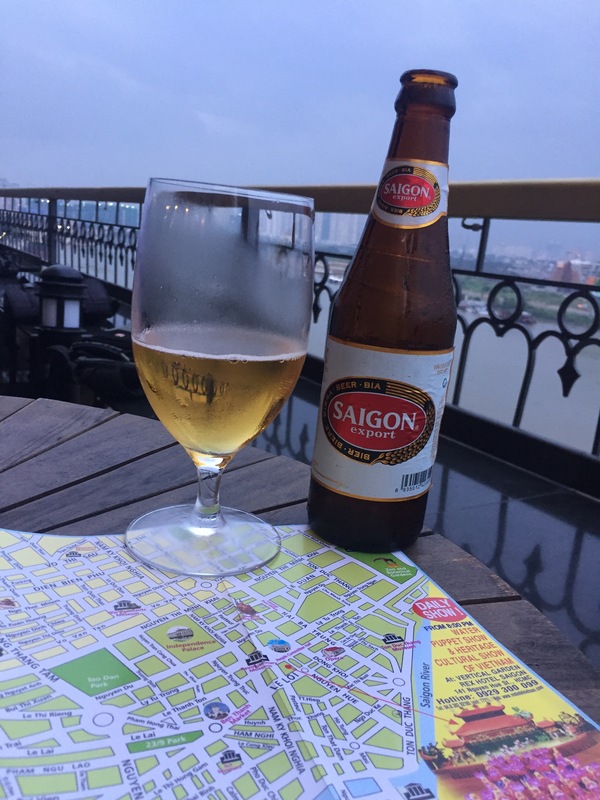 The hotel has a lovely rooftop bar/restaurant and the fabulous breakfast spread is served on an open terrace overlooking Saigon life. Service is welcoming and efficient and the hotel has a relaxed elegance and calm about it – most welcome after the bustling life at street level. Have you been to Vietnam? What was your favourite part of the trip? I’d love to hear your recommendations – they’ll give me an excuse to return. Read about my stay at the fabulous Victoria Beach Hotel and Spa in the seaside town of Phan Thiet. Your pictures are so enticing! make me want to take off for a vacation right now! These photos were stunning!! 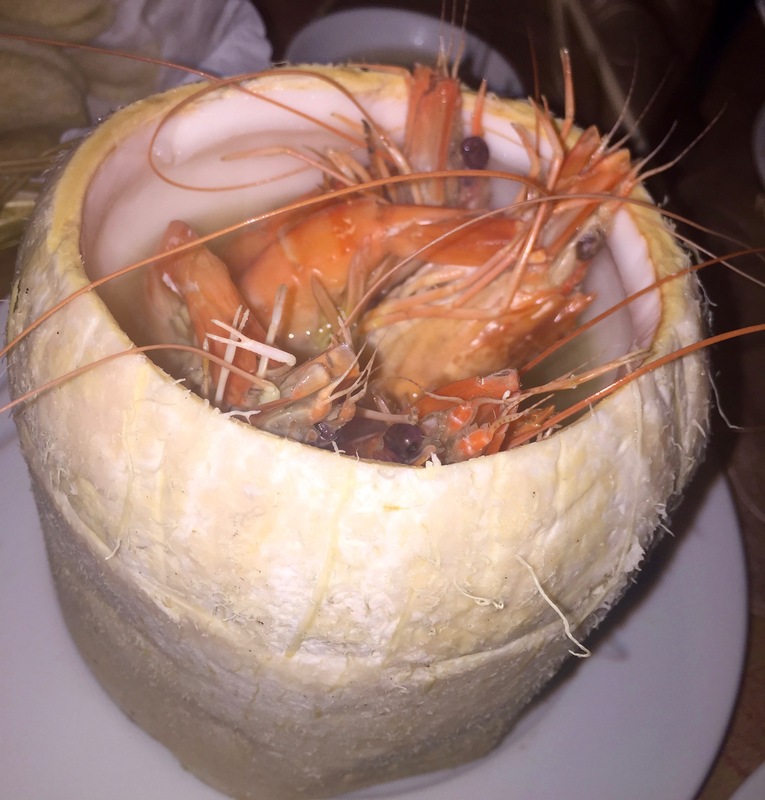 I love the shrimp in a coconut. Great post! Thank you. The shrimp was absolutely delicious. Have you been to Vietnam? Thank you so much. Saigon is so full of photo opportunities. I had such a great time there. The dinner cruise was lovely, with singers and musicians to entertain and really lovely food. Also love your blog name! I have not but I would love to one day!